Lots of Christmas cookies and still more to come... Cookies for Santa's special delivery. How fun are these? My favorites are the ones with the pink hat, but they are both pretty fun. So here's the comparison of red hat and pink hat. I love the pink. I know, you're so surprised. Then here's a comparison of white sanding sugar on the beard or white glitter flakes. Which ones do you like better? Sanding sugar on the left or glitter flakes on the right? I thought I would like the glitter flakes better so I bought a few of them in different colors, but I decided that I like sanding sugar better. 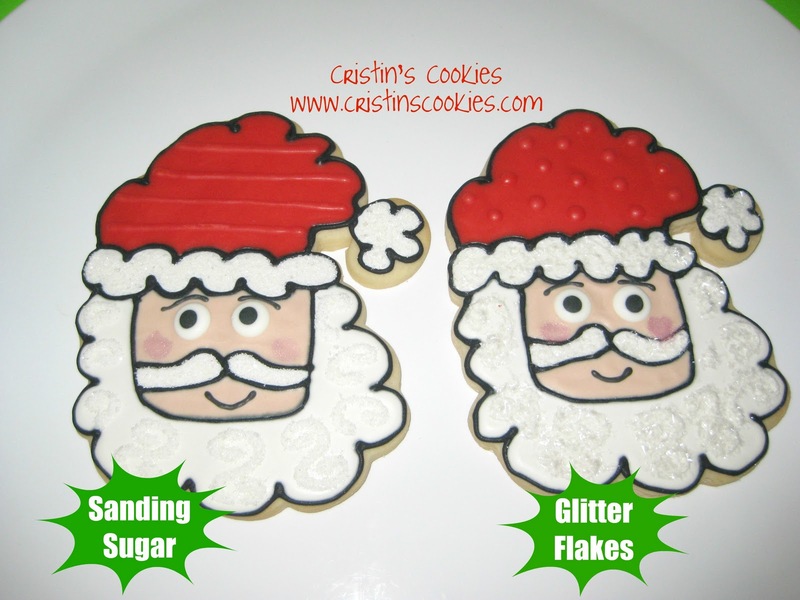 The glitter flakes sparkle a little more, but the sanding sugar tastes better whereas the glitter flakes have no flavor. I love the santa. It is so FUN. Where did you find the cookie cutter? @Nicole ~ The Diva Thank you Nicole. I have two of the Santa cookie cutters. One is from CopperGifts.com measuring 5x4 and the other is from Amazon's Old River Road measuring 6.25 x 4.75. Love Santa with the glitter beard! Your little angels in the snow globes are adorable.